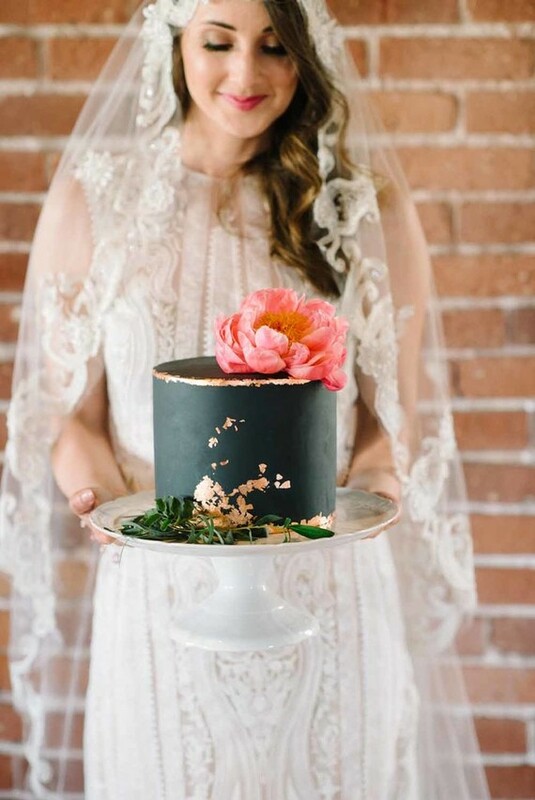 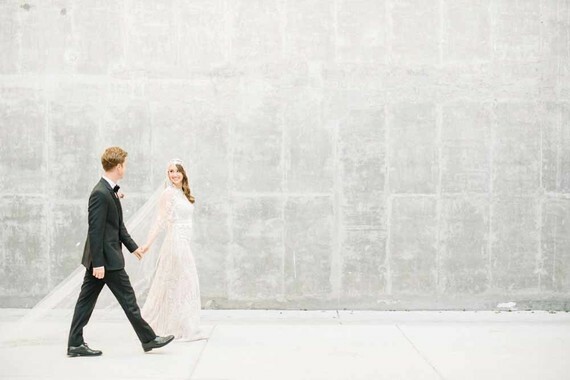 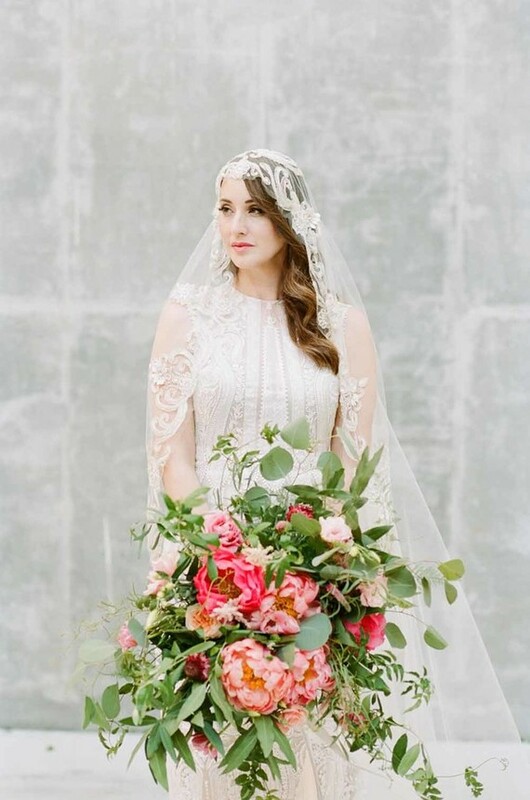 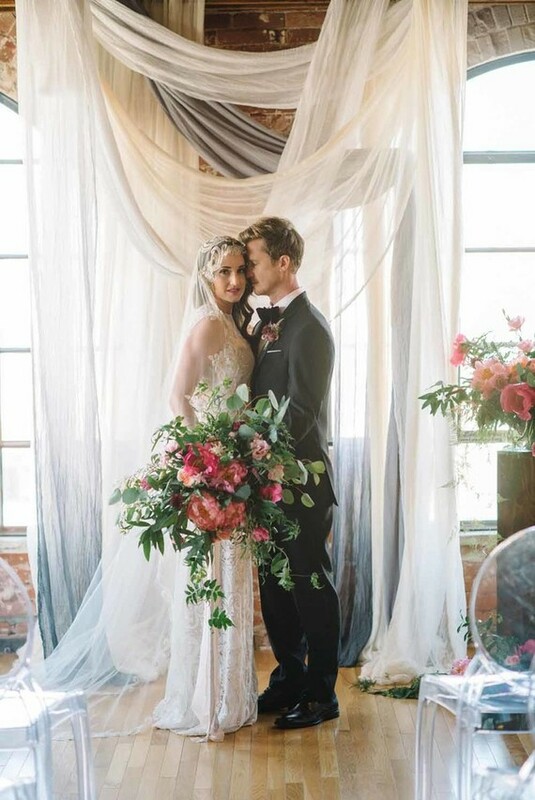 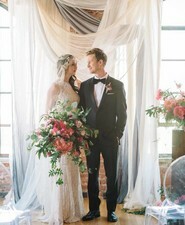 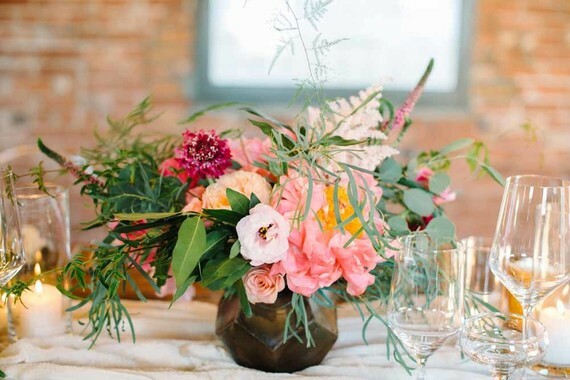 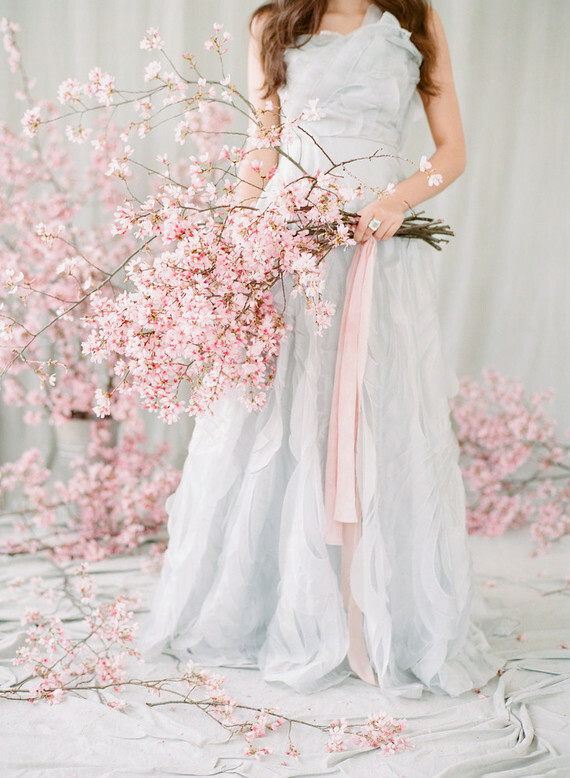 When Nicole of Nicole George Event Planning & Design sent this feminine warehouse wedding editorial our way, she said it was for couples looking to blend an urban aesthetic and romantic and playful undertones. 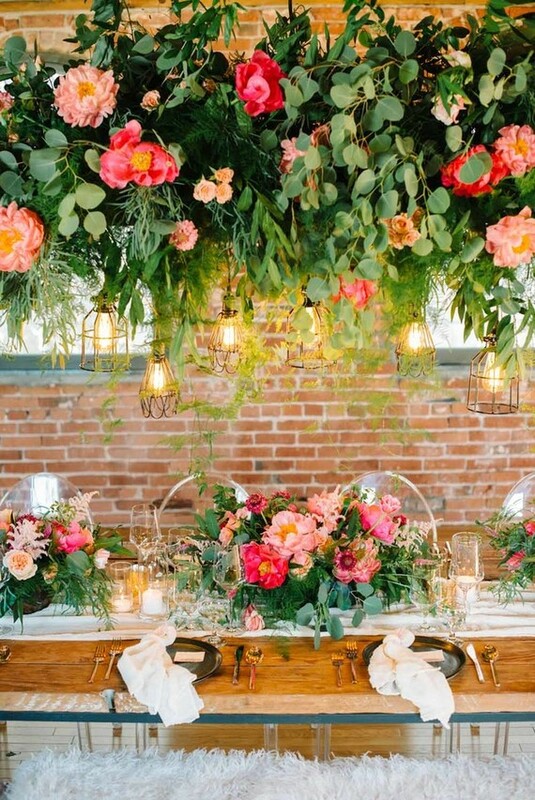 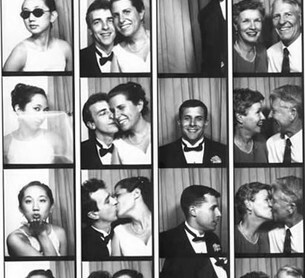 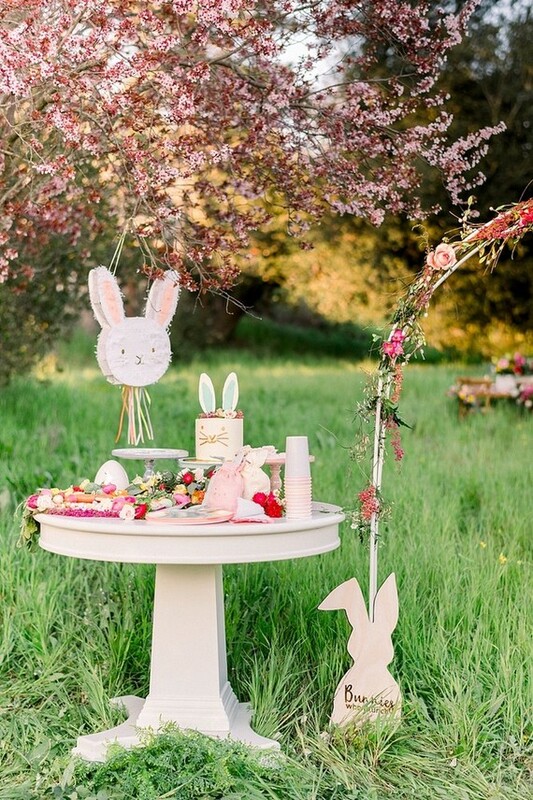 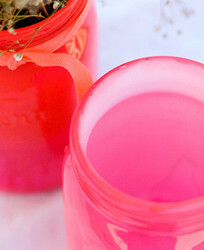 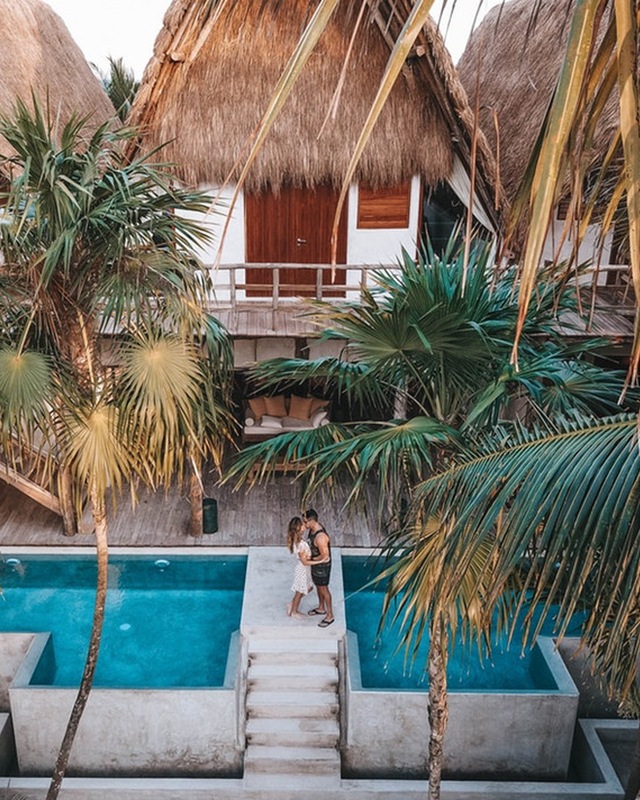 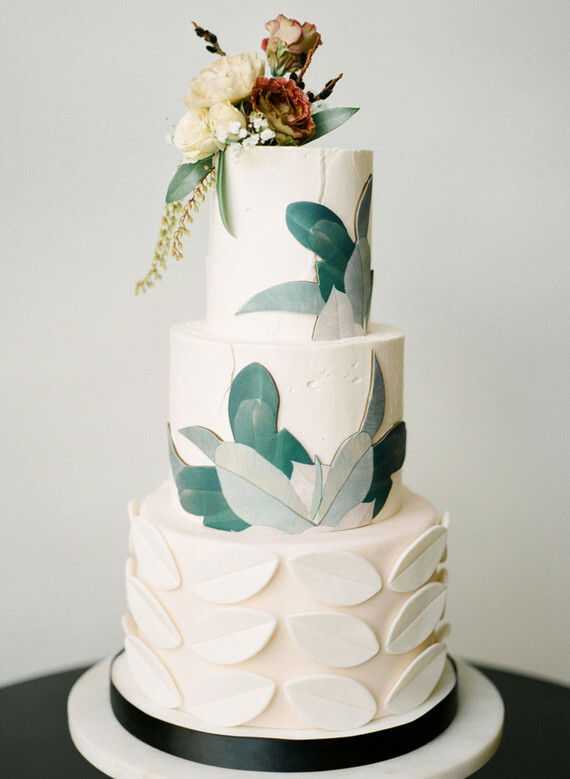 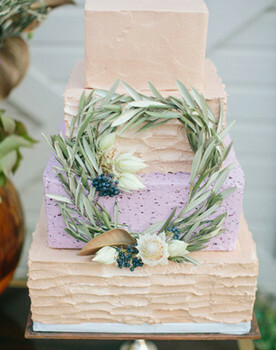 So if you’re looking for ways to keep your wedding modern and clean but still vibrant and fun, this may be just the recipe. 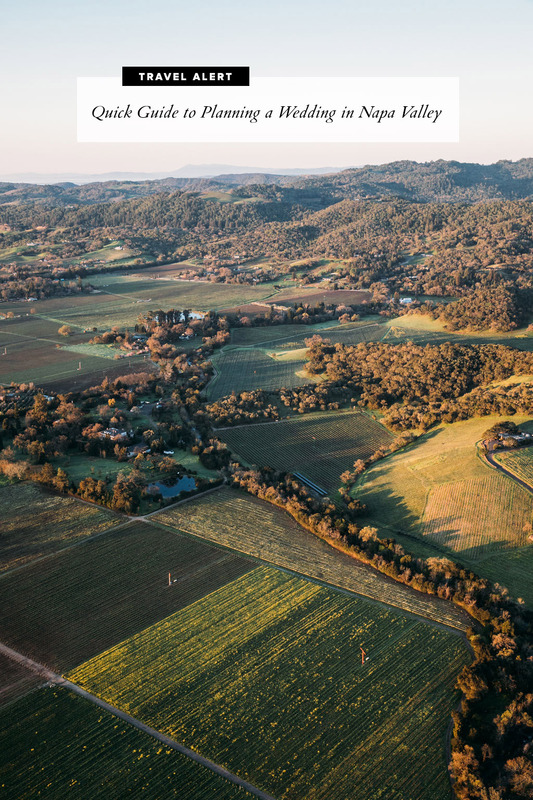 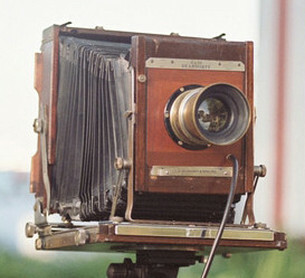 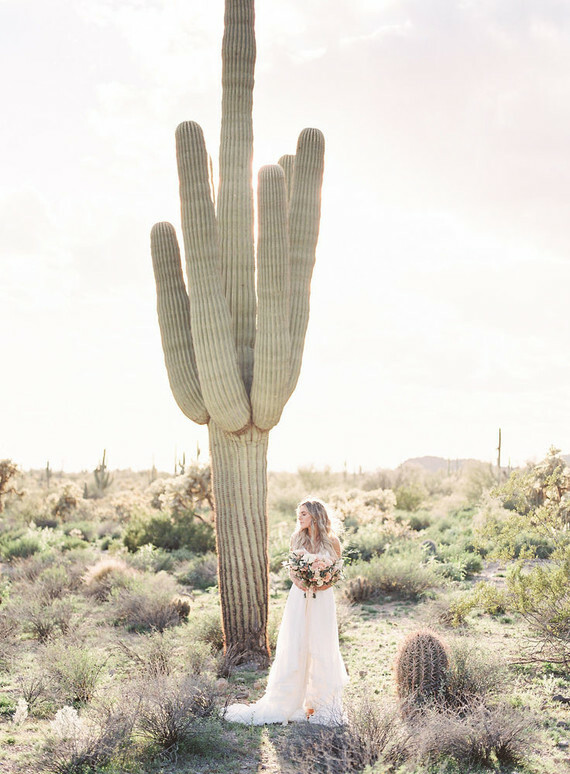 Thanks to Krista Mason Photography for sharing the images! 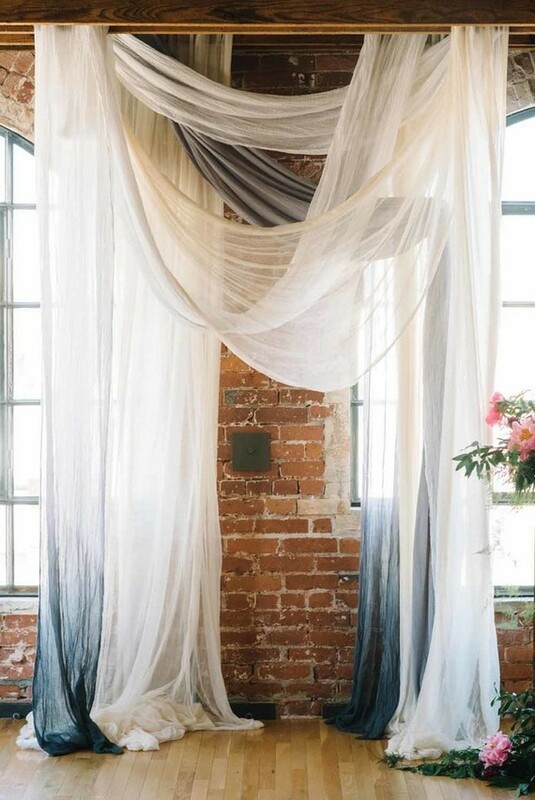 Nicole says, Howl, an intimate loft in downtown Long Beach, balanced our elegant and refined design with a touch of edginess you only get with industrial style venues. 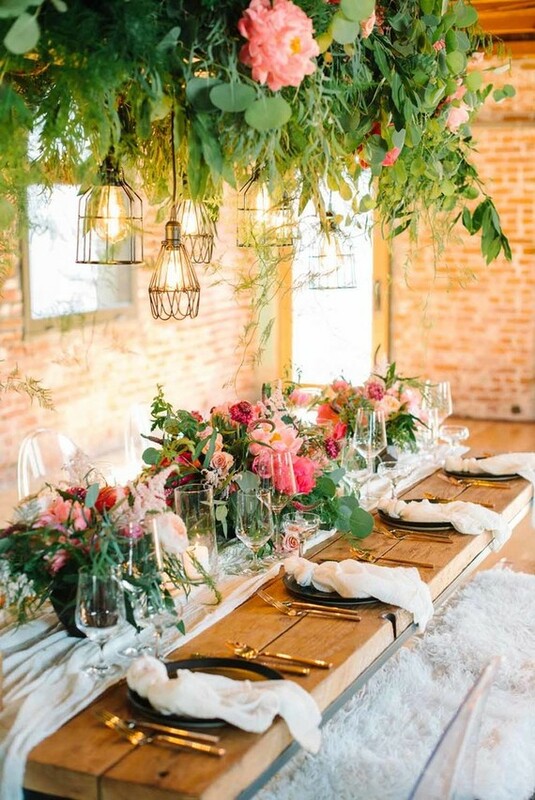 I wanted the venue to speak for itself and enhance the design, so we used the building’s exposed brick, original beams and windows as focal points. 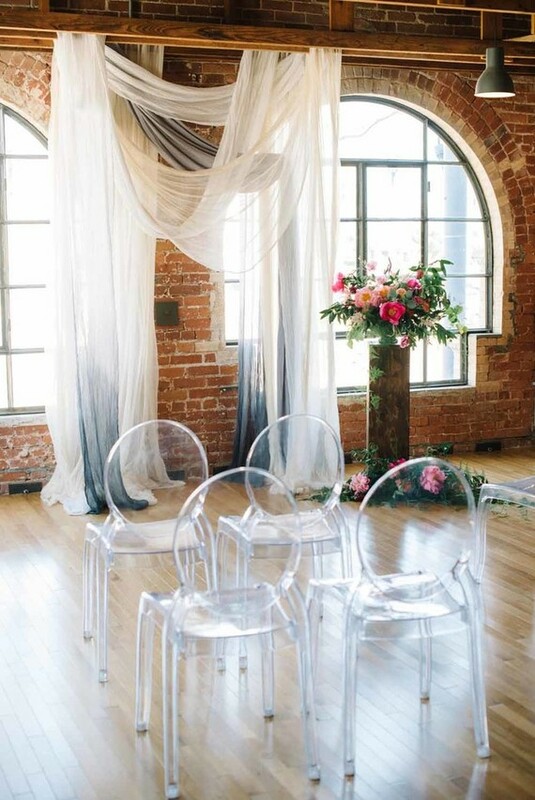 It was a no brainer to design our ceremony space in front of the original arching windows. 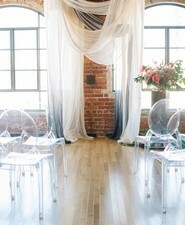 Between the sun pouring in and our asymmetrical hand-dyed draping, the ceremony instantly turns intimate and romantic. 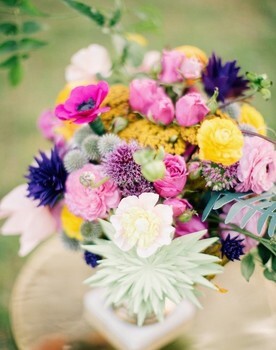 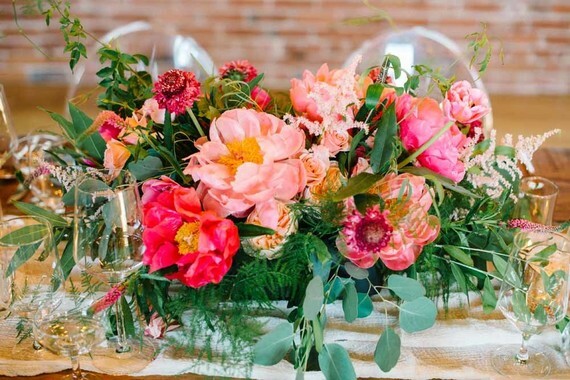 Gotta hand it to Peony & Plum for proving that it’s possible to love peonies *even more*. 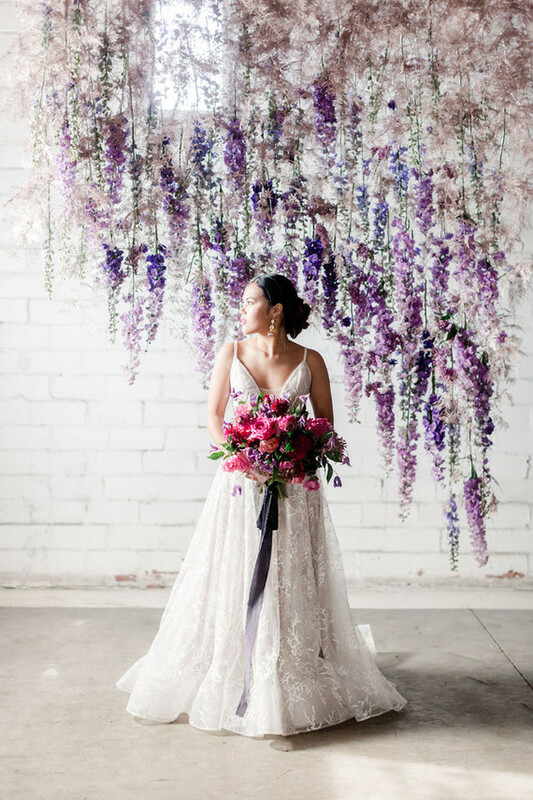 Isn’t this hanging floral installation incredible? 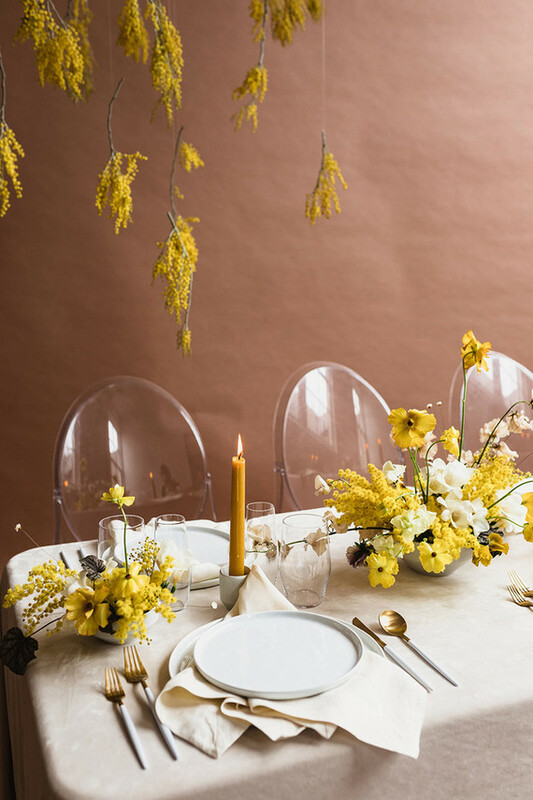 With the floral arrangements full of texture and color, the team kept the rest of the tableware a bit more clean + minimal. 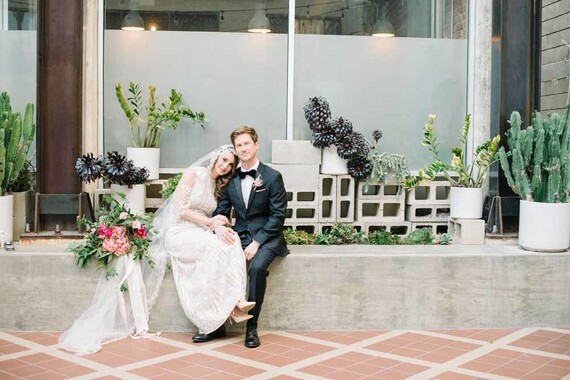 The color palette was surprisingly neutral with black, ivories, and metallics, but the floral design captured the vibrant and feminine touches necessary to transition the space from a traditional warehouse to a modern and romantic oasis. 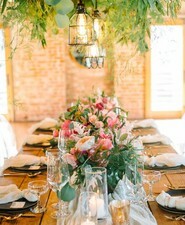 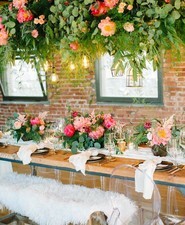 The lush and textural floral chandelier added playfulness. 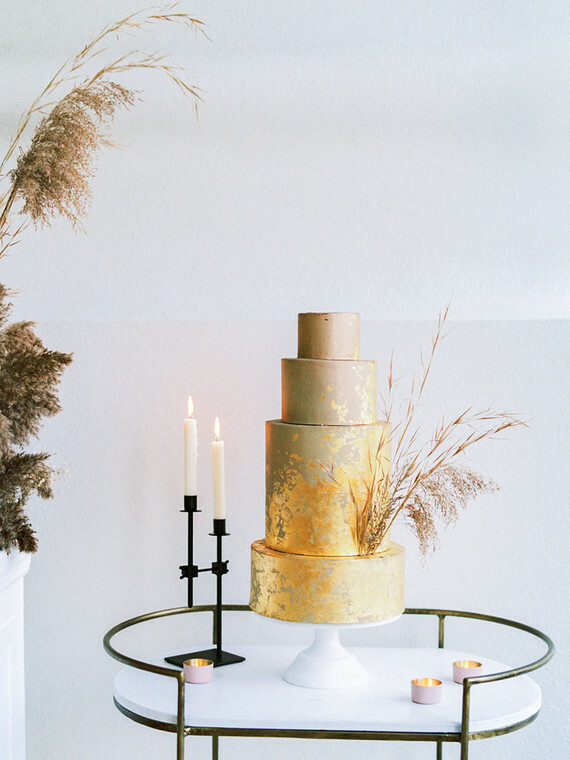 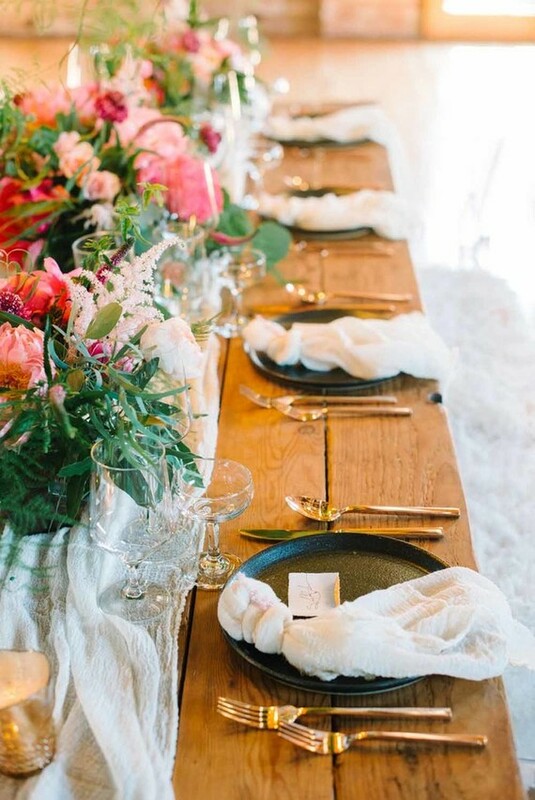 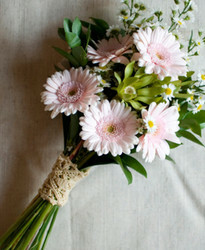 The hand-dyed napkins, cozy sheepskin throws, and free-spirited calligraphy added softness. 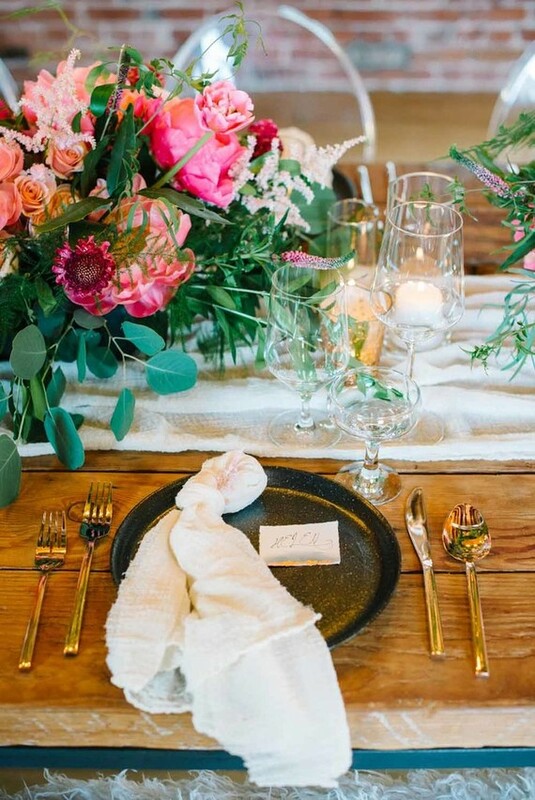 And the black stoneware and rose gold flatware added elegance. 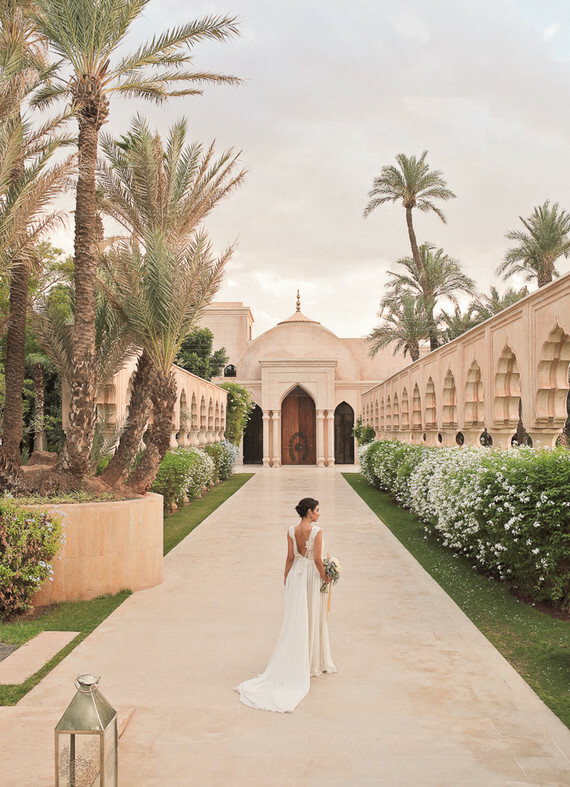 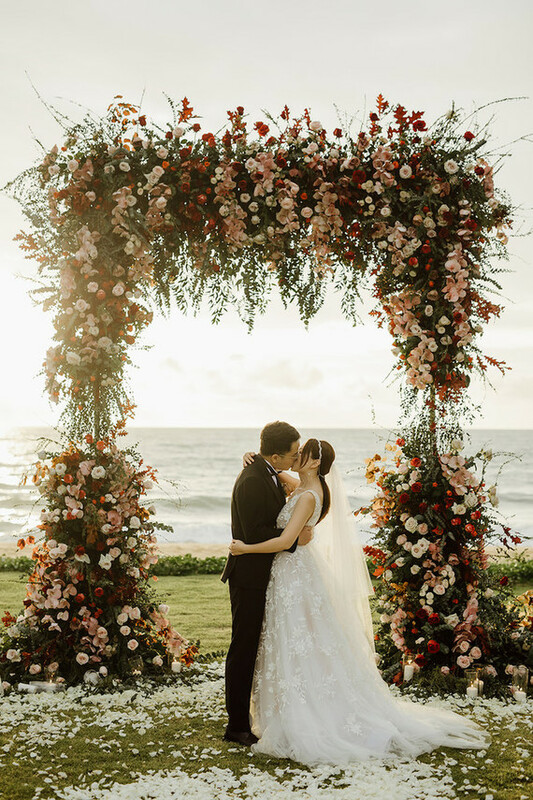 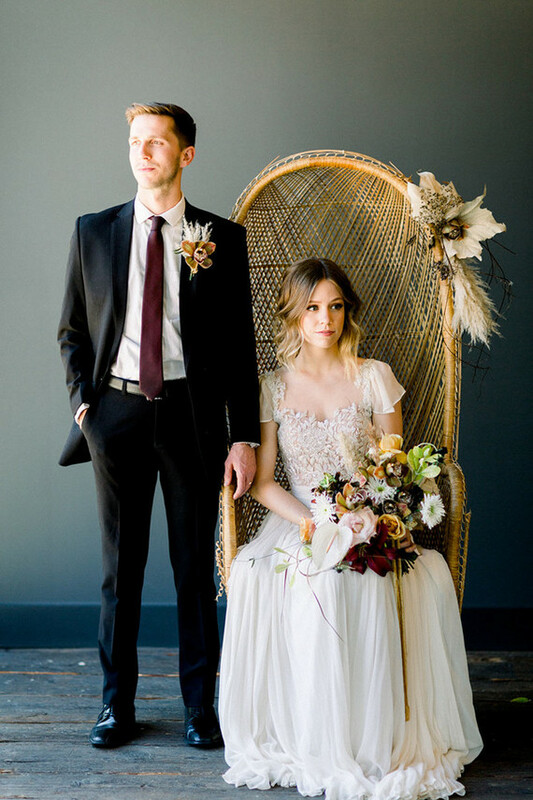 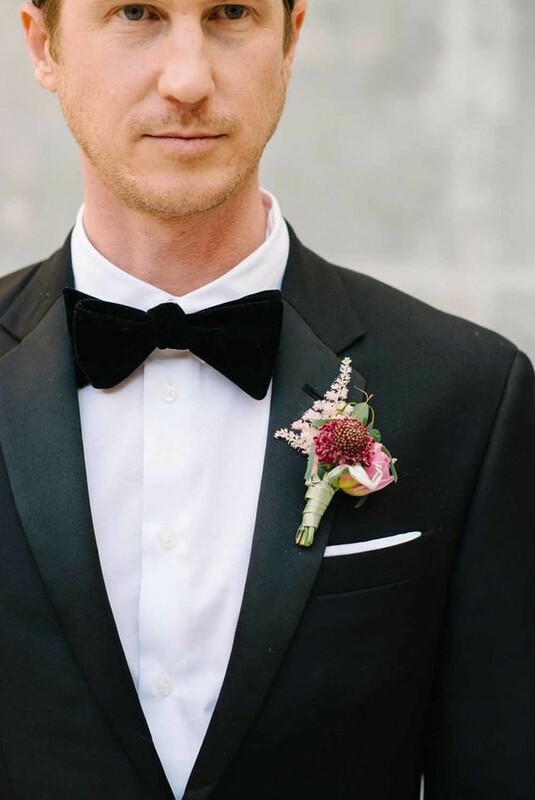 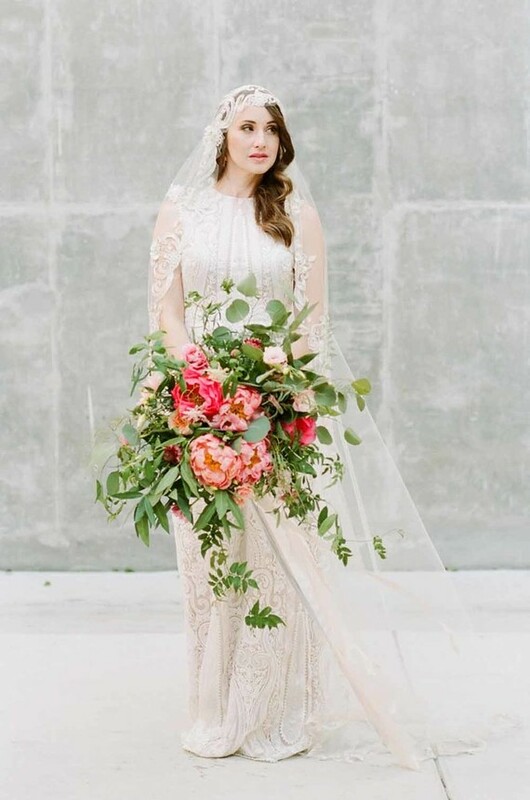 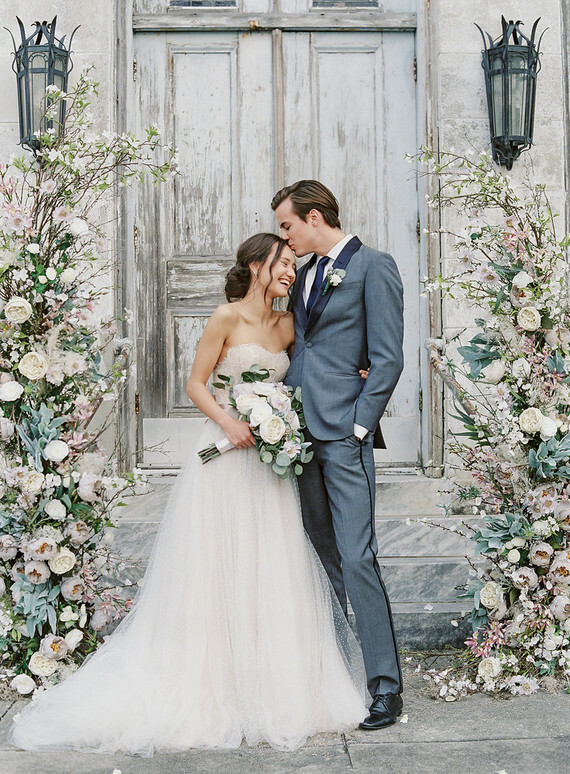 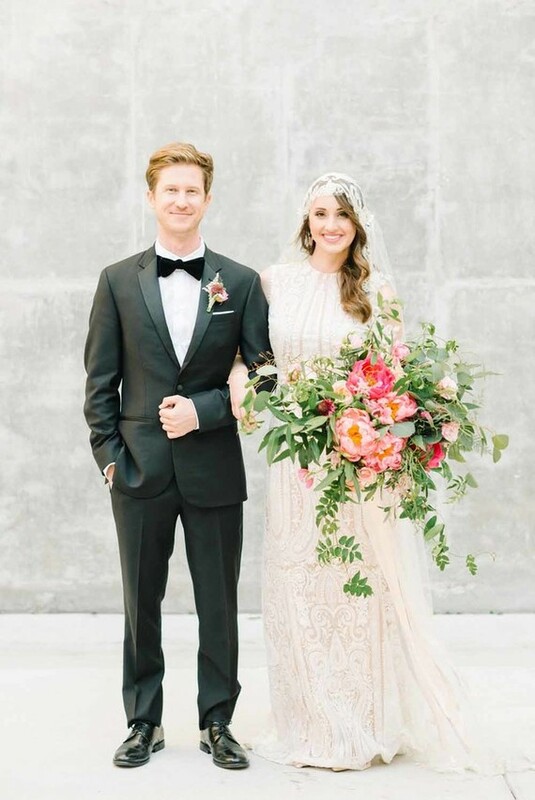 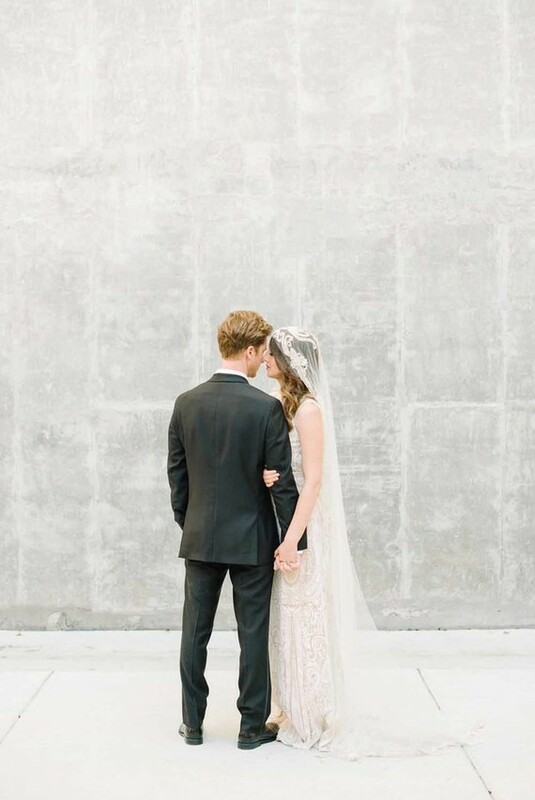 They also took advantage of modern romantic touches with a lacy ensemble by Claire Pettibone for the bride and a classic tux from The Black Tux for the groom. 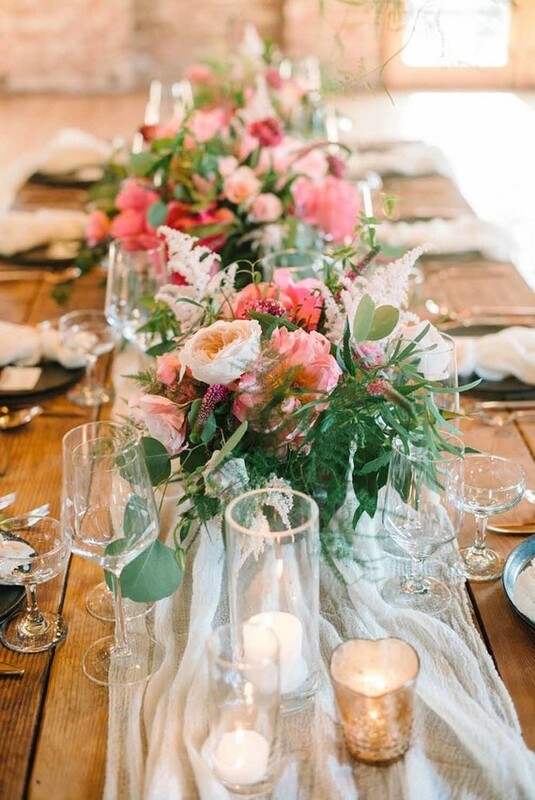 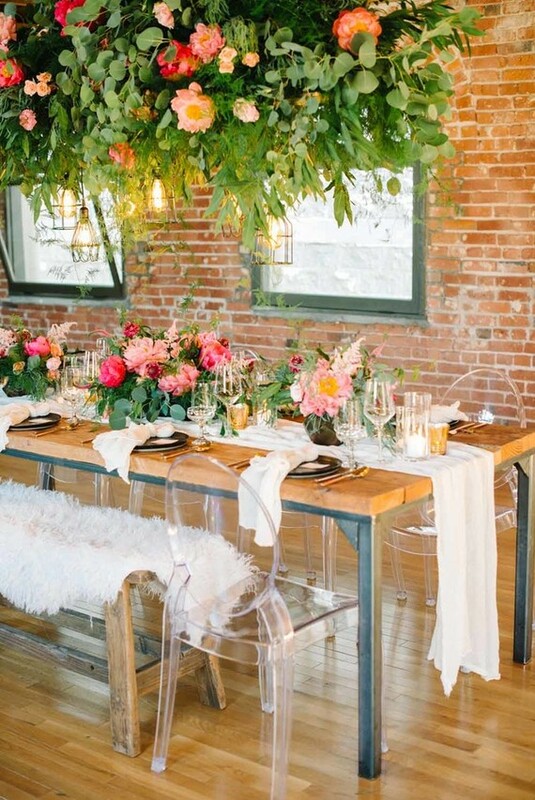 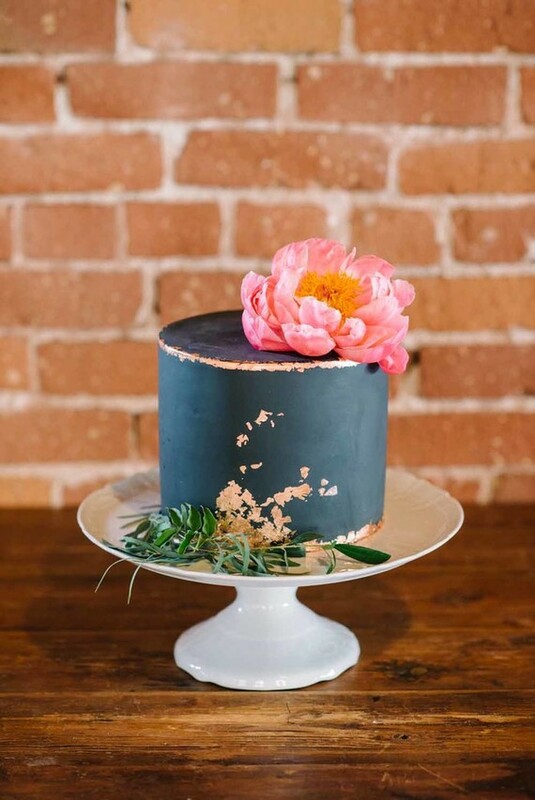 Urban venue, modern design, tons of peonies… What more could you ask for? 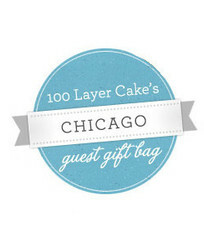 Thanks to the team below for sharing today!